Do you have a dental emergency? Contact Kaplan Dental Clinic immediately to get professional attention. If left untreated, dental problems can become increasingly serious and painful. Make sure you get the treatment you deserve as soon as possible. If you have a dental emergency call us immediately. A severe toothache can be debilitating and can make it impossible to go about your day-to-day life. It can also be a sign of a serious problem such as an infection. If you are experiencing a toothache, contact Kaplan Dental Clinic as soon as possible to make an appointment. If you have received trauma to the tooth, it may result in a chipped, cracked or fractured tooth you’re you have a chipped tooth and are not experiencing any pain, this likely does not constitute a dental emergency. Despite this, you should make an appointment with your dentist very soon to get the problem sorted out. A tooth that has been cracked or fractured is a much more serious and is considered a dental emergency because damage may have occurred to the inner part of the tooth. If you have experienced a painful crack or fracture to the tooth, contact Kaplan Dental Clinic immediately to make your emergency appointment. If you have sustained a serious injury to your cheeks, lips, mouth or tongue, this is usually considered a dental emergency – contact Kaplan Dental Clinic immediately to get evaluated by your dentist. If you have received an injury to any of these areas of the mouth, be sure to clean the area immediately with warm water and get to your dentist as soon as possible. If your dentist is unavailable, you should visit the nearest hospital to receive medical assistance. If your tooth has been knocked out, contact Kaplan Dental Clinic right away to receive immediate attention. 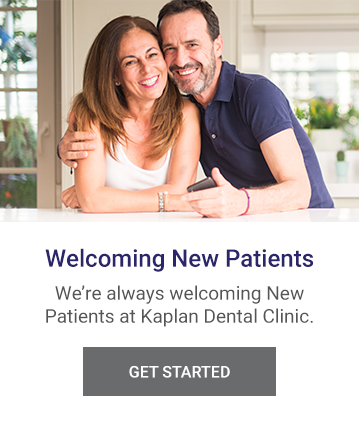 If you have any other dental problem and think you might require immediate assistance from a dentist, contact Kaplan Dental Clinic immediately. We are here to help you! My goal is to help my patients ensure the health and longevity of their teeth and smiles. Every day I am looking for new ways to help our family of patients achieve their overall oral health goals. If left untreated, dental problems can become increasingly serious and painful. Make sure you get the treatment need as soon as possible. Get immediate professional attention at Kaplan Dental Clinic.